Two Programs and an interview. Tonight (Thursday, October 15th) Idaho Public Television will focus on wolves in Idaho. They will start off the night with an episode of Outdoor Idaho and open up discussion about wolves following the program on Dialogue where you can call in to ask questions of the panelists. This morning Boise State Radio played an interesting interview with Carter Niemeyer. To Catch a Wolf an interview with Carter Niemeyer about wolf trapping in Idaho. Didn’t I see that outfitter guy on the show in the movie Deliverance? It didn’t really. I thought Carter was good, Jon R. and the outfitter got to talk too much, Susan didn’t get enough time. For those who missed it, Dialogue has posted video of the program and a web extra. Click on the link above. Outdoor Idaho was pretty good, Dialogue was dissapointing. Marcia Franklin seemed unprepared. For such a contentious topic why would your first questions concern “what will IDFG do with the money from wolf tags” and has “Butch Otter filled his”? The hunter from Kamiah at least pushed his opinion, the other three seemed bored. Why did they even agree to participate? We want Ralph! Where is the linked to see the program I am really interested !! One other thing we are in trouble on some political shows it was mention that Barack likes Bush and calls him for advice. He blocks out Bill Clinton because of the campaign,so he is following his lead on the wolves, now I got the picture, I feel really bad. Mike Popp is a freakin goober. I’m glad he filled everyone in on the fact that wolves are killing deer and elk–that’s groundbreaking information. I find it interesting that he makes it sound like a travesty when ungulates die, but fails to see the hypocricy when there are 100,000 hunters out all trying to kill, uhhh, deer and elk? I find it interesting that he makes it sound like a travesty when ungulates die, but fails to see the hypocricy when there are 100,000 hunters out all trying to kill, uhhh, deer and elk? I have yet to see, hear or read anything from a media person in this state, whether it be radio,newspaper or tv who knows anything about wolves. It’s laughable and they should stay away from the topic. what political shows Richie? (re:Obama “liking” ex Pres. Bush) That seems like “crazymaking” tom me- don’t believe everything you hear! To Gline: In my area the left is MSMBC,MIDDLE is CNN and the right is FOX. Now it has been said that Obama speaks to George Bush for advice more than Bill Clinton, and there was a note On Froday he appeared, I believe with Bush somewhere and George announced Obama on stage. Now do you know Hillary was in line for Vice President, but too much mud slinging during campaign. But I wanted the link to see the t.v. program about the wolves in Idaho . One person I forgot his screen name, said their was a linked below on the other page. But I wanted so speak about my experience with wolves, one in slue creek I believe. The wolf came off a hill running and I was no more than forty to fifty yards away. 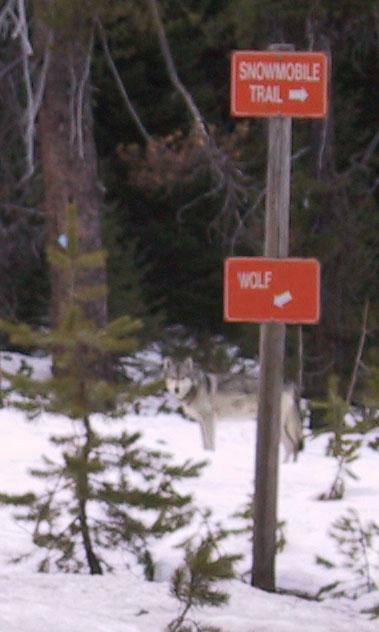 I had a dead battery on me at the time and a live one for my camera in my truck, could not take a picture of the wolf , the ranger told me a rookie mistake. The wolf ran in and out of the aspens until a pack howled to call him across the river. He staired at me for a long time, found out later he was eating a carcass in the trees of an elk, it was the best feeling I had in my life. I also caught pictures of an entire pack in Lamar valley told this story before. So when I take my three dogs now into my woodland and when they hit an open area, my mind goes back to the pack in Lamar valley, the colors of the pack, a black wolf,brown wolf and a blond wolf, actually their was approximately twelve to thirteen wolves. I would love to leave everything behind the beach, friends relationship etc, take my dogs and the cat, sell my homes and be around the wolves and grizzly bears for the remaining years I have. But I cannot live in a state or anywhere in this country where the greed for money makes me sick to my stomach. How could we introduce wolves for science then have tourist watch these creatures and believe in themselves and this country again. This brings in profit, a great deal of money etc ,then another administration comes in and sells tags to kill these animals again for money. This is all on the backs of these animals, if we look at ourselves we should be ashamed, again I am not speaking of the people who care for the wild side of nature and who love these beautiful animals. But the profiteers, who take advantage of the people who love these animals, and the biologist who seek to live and understand nature. The administration, big people, the people who have the money and want more power and control and power, they crash the whole thing on us. They side with the NRA and the hunters and the farmers, as Ralph puts it, the lords of the land . I told you guys last week that the NRA was also behind this, but save bears I believe denied this but he will clear up his position I believe. Sorry I wrote so much but this hurts me deeply. As for Obama he better get his act together,he has already done more harm than good, health care or no health care , he will lose a big part of his base, this must get on animal planet on t.v. ;sixty minutes etc. I am getting e-mails from defenders, the bio diversity group and soon from earthjustice I believe I must give what I can or cannot sleep with myself. To Gline; We also have air america, Randi Rhodes my favorite, Rachael Maedow, Tom Hartman he lokes to like past history with today Thomas Jefferson , John Adams etc. I agree with you there Richie. It’s a clash of cultures, kind of like every time we have a presidential regime change, ie Bush/Obama. the clash and turnover begins again… and again, and again! I love your personal wolf story. Very beautiful. and your statement, “But I cannot live in a state or anywhere in this country where the greed for money makes me sick to my stomach.” that is everywhere, as I’m sure you know. Just have to live where you love the place and deal with the rest. Advocate for what you believe in no matter what. Many people do not understand behavior of animals, this is associated with my telling the story of the wolf in slough creek. When I came out of the creek after the encounter thier was a professor. He had his hiking boots,his tape recorder his camper etc, but he was outside almost on the main road, how could he observe from out their? He told me I was lucky that the wolf did not attacked me his reason was the wolf must have been a young wolf. O.K. he is the expert but I had bear spray and a boat horn, a ranger told me I was not going to use it, I said of course not. But if a wolf heard that sound I am sure he would of ran real fast. So their are ways without guns, people just like the power of guns and about the expert professor draw your own conclusions. The President Bush that Obama joined for an event last week promoting volunteerism was the eldest, George H.W. Bush. That’s the same Bush that Bill Clinton has also partnered with on a range of issues. The idea that Obama is consulting with either Bush on wolves or with the younger Bush about anything is ridiculous. George H.W. Bush also said that Rachel Maddow and Keith Olberman were “sick puppies” because of their criticism of his little shrub! Richie – I love your story and your enthusiasm! I haven’t been following this exchange. What is the point? I know it’s very not relevant or constructive to have responded, but it was just so damn silly. As others have stated, Obama isn’t helping wolves because he’s ignorant on conservation issues. I think most recent presidents were similar, but the good ones have had people working for them that are schooled in wildlife and wildlands issues. Thanks for explaining. A lot of you may not know this, but the number of visits to this web site has exploded over the last 3 weeks. I don’t have time to read all the threads. Regarding Obama, this is just my opinion, but what a disappointment he is to me in almost every area. I would like someone else to support, but I look at the opposition party, the tea-partiers, and the candidates who say a woman’s place is barefoot and pregnant, and there is just nothing there. I have never seen American politics so out of touch and ineffective. Alas, Ralph, there’s much in what you say, although I’m happy to report that we’ve been pretty lucky here in NM with some of our recently elected officeholders, e.g. Tom Udall in the Senate, and Ben Ray Lujan and Martin Heinrich in the House. Not to mention a number of smart, young county commissioners and city council members in Dona Ana County, all of whom support the Organ Mountains/Desert Peaks Wilderness bill. Now if we can just get them re-elected…. The national scene is somewhat bleak, I’ll admit, although I never had any illusions about Obama as friend of wildlife or wild places. He was definitely not my first choice.